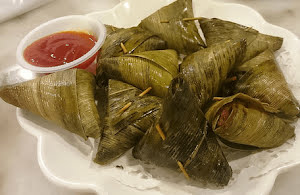 Do try this extremely delicious appetizers consisting of fried chicken bites wrapped in pandan leaves. This popular Thai recipe is one of my favorites. To get the best results, use canola oil and fry on a high flame. The fragrant pandan leaves induce a unique flavor and aroma within chicken bites. I've served it with orange and ginger sauce though palm sugar and soy sauce goes well with it. Needless to say, pandan leaves cannot be substituted with anything else. Some of my family members prefer to relish these chicken bites with tamarind sauce. Keep the marinated chicken for at least an hour to let the flavors gel with the chicken chunks. Let's fry these yummy chicken bites for our loved ones and friends. Savor these flavorful and juicy chicken wraps deep fried delicately which gives them an aromatic and distinct taste which stays on the taste buds for long. Combine cilantro roots, garlic cloves, white peppercorns, ginger, sesame oil, oyster sauce, soy sauce, coconut milk, and a pinch of salt in blender. Pulse for a few seconds to make a coarse paste. Transfer the paste in a large bowl and add chicken chunks in it. Apply the paste well on chicken pieces and keep aside at least for an hour. Wrap the chicken bites in pandan leaves and secure with a toothpick. Heat canola oil in a deep frying pan. Fry all the wrapped chicken bites in batches till they turn golden brown. Serve hot with your favorite dip or sauce.